In my ideal world, I won’t be pinned down to a location, I won’t own a house, and I won't be constantly looking to destress all the time. Instead, I’ll be living in different countries every few months, running my businesses from the deserted beaches of Albania, the mountains of Liechtenstein, or even somewhere close to home like the island of Guimaras. I’m thinking of a more luxurious version of the digital nomad lifestyle — my family and I will explore a new location every six months or so, we’ll breathe in the culture of the place, and maybe even be considered adopted locals after a few months. If you’re getting a Tim Ferris vibe while reading this, it’s because I got this idea from his book The 4-Hour Workweek: Escape 9-5, Live Anywhere. It’s a must read. Go. Get It. Now. 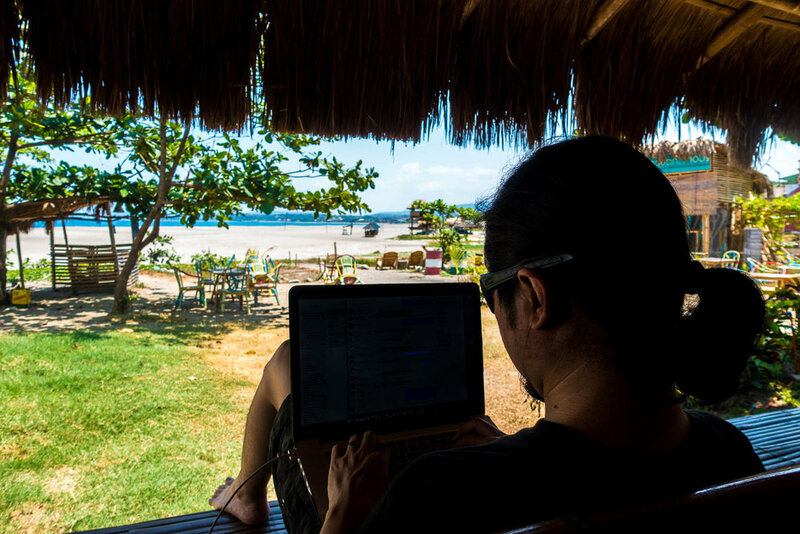 Work mode on while on vacation in La Union. Article here! Photo by Kaye Olfindo. But let’s go back to Earth, shall we? Since this “live anywhere” lifestyle isn’t my reality right now, my family and I try to get away from the city every so often just to take in new sights, experience new things, and just get lost even for a little bit. And if we’re stuck in the city, I try to look for new activities or places to visit every so often just to break the monotony of our school-work-school-work-school-work routine. And for this week it was Em Sulit of Game Changer PH to the rescue! Em invited the kids and I to the media launch of Bounce, a new trampoline park in SM Southmall (South Tower). This was a very timely trip down south as I was going through a very very busy workweek and will most likely not experience a weekend (or two) as work is getting crazier and crazier by the day. So I picked up the kids in school earlier than usual, took the afternoon off from work, and just made sure to have fun at Bounce. 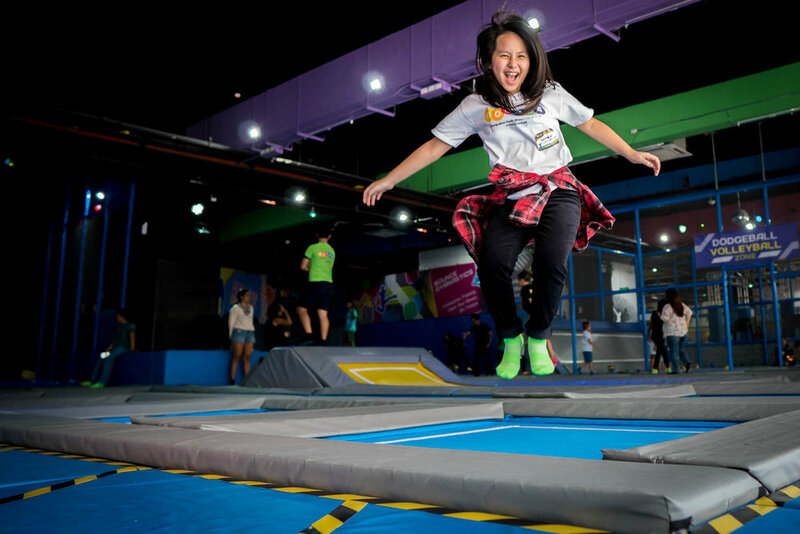 I usually avoid trampoline parks because my hyperactive imagination can envision all the germs crawling on the foam mats, etc. but when I read Em’s comment about the park’s regular deep cleaning sessions and it passing the OC standards of moms, I was sold! And from the looks on my kids' faces, I must say the decision to play hooky for the day was well worth it. My 6 y/o, Erin, was one of the sweatiest kids at the park as she couldn't stop bouncing, running and climbing all over the place! I think I was also the sweatiest mama there. Haha! So I'm not really the mosh pit kind of girl but my 11 y/o, Talia, dared me to jump in and I did so with no hesitation. Foam can do me no harm! 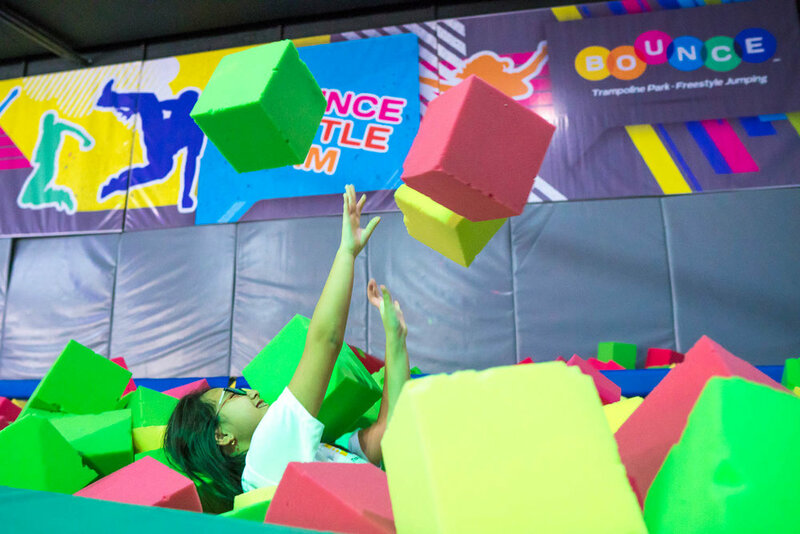 It was actually quite comfortable inside the foam pit and I could even take a nap there if only there was no danger of getting trampled on by little humans. I must admit though, getting back up on the mat was a bit of a struggle. Thanks for the rescue, Sheila! I took Erin to an indoor wall climbing place a few months back and after reaching more than halfway up the wall, she looked down at us, turned pale, then suddenly became deathly afraid to move. And that's with complete climbing equipment AND a belayer guiding her. Long story short, Erin stopped climbing and refused to go on another wall after that experience. So imagine my surprise when I saw her climbing up Bounce's wall with no ropes or guide to assist her. I just left for a minutes to put something in the car and when I got back she was already on top of the wall! Ok, so this particular wall isn't as high as the last wall she tried to conquer but still . . . I am so proud that she conquered her fears all by herself! Check out this really geeky but super interesting article about the benefits of trampoline exercise. The best part for me is the first one --- "According to NASAs Journal of Applied Physiology, rebounding exercise is 68% more efficient than jogging. A study from NASA also found that a 150 pound individual spending 1 hour on a rebounder will burn more calories than the same person jogging for an hour." Ok, that's it for my usual 40 minutes at the treadmill. Gimme a trampoline any day! And if your body can't take any more jumping and running and all that physical activity, Bounce has a lot of nice spots where you can take photos perfect for your Instagram feed. Yup, that's one of our favorite family activities! Founder Mark Hogsden (second from left) along with the other owners of Bounce. Photo by Sheila Catilo. Thanks again for having us at your event, Bounce Philippines and Game Changer PH! We can't wait to go back and bring the whole OTT and Get Lost team with us. #BounceTayo! Bounce is at the ground level of South Tower (beside SM Southmall in Las Piñas). Visit their website and follow them on Facebook and Instagram to know more about this new fun spot in the metro! TJ and Em Sulit of Game Changer PH. Photo by Sheila Catilo.